It was with some trepidation that, when asked by the Herald-Citizen editors if I’d be willing to move to the Opinion page of the Sunday paper, I said yes. “You don’t have write political columns all the time,” Lindsay McReynolds assured me. “Only when you want to.” Coincidentally and fortunately, it just so happens that—right now–there’s a political issue I do want to write about for the second week in a row: overturning the direct election of U.S. Senators. Ryan Williams (R), Putnam County’s representative in the Tennessee General Assembly, and Senator Frank Nicely (R) of Strawberry Plains have introduced legislation that would do away with primary elections for U.S. Senate. Instead, state legislators would choose the Republican and Democratic candidates. Tennessee voters would then make their choice for Senator during the general election. Mr. Williams defended his bill on this page in last week’s paper and in an interview with H-C editor Kate Cook in an article published on January 13. He associates the 17th Amendment, which was passed in 1913 and calls for direct election of U.S. Senators rather than election by state legislatures, with “federal overreach.” I don’t get it. 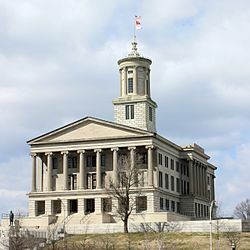 The amendment allows Tennessee voters to nominate Tennessee candidates and then choose a winner to represent Tennessee interests in Washington. How is that federal overreach? He also decries the vast amounts of money spent in Senate campaigns, claiming that such money could be better spent hiring teachers. I don’t disagree. But campaign money isn’t part of the state budget. How does this argument make any sense at all? Mr. Williams contends that his bill would allow the legislature to place term limits on U.S. Senators, a move that was declared unconstitutional in the 1995 U.S. Supreme Court decision “U.S. Term Limits v. Thornton.” His plan would circumvent that ruling this way: when a U.S. Senator from Tennessee has served two terms, the members of his/her party in the state legislature simply refuse to nominate him or her again. Should the incumbent Senator want to run for a subsequent term, he or she would have to run as an independent in the general election. Crafty, huh? As for the claim that his bill would insure that Tennesseans’ “shared values” would be represented in the U.S. Senate, I’d like to know exactly which shared values Mr. Williams is referring to. Paying workers a living wage? Providing adequate health care for everyone? Fixing our infrastructure? Taking care of our planet? If so, sign me up. But somehow I have my doubts. Last but not least, it must be noted that overturning or undermining the 17th Amendment has long been a goal of the American Legislative Exchange Council (ALEC), a right-leaning “think tank” that writes up ideas and talking points and sends them out to state legislators throughout the country. I’ve found no evidence that Ryan Williams has formal ties to ALEC. However, Senator Nicely does. Here’s hoping that HB 21 and SB 0027 die a quick death in the 2019 General Assembly.